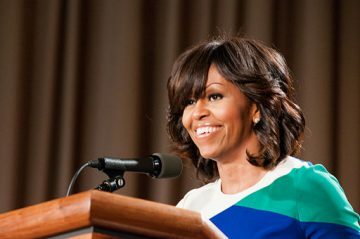 In her commitment to lowering skyrocketing obesity rates, Mrs. Obama has been getting the message out for the past 5 years to eat more healthily and to get moving. She advocates that parents make simple changes at the dinner table (the same effective ones she made years ago when her pediatrician expressed some concern about her daughters’ weight) – eating more fruits and vegetables, eliminating processed and sugary foods, and cooking at home. Anyone who has regular family dinners knows what the First Lady is talking about. Family dinners are the most reliable time of the day for us to connect and check in with one another. Dinner is a daily ritual that takes us away from the hubbub of everyday anxieties and can be a giant stress-reliever for kids as well as parents – and even the President. And, it’s just commonsense that home-cooked meals are generally more nutritious than fast-food, take-out, or restaurant meals. If you’re already having regular dinners, you may not need any more convincing. But sometimes reading scientific data can be the extra nudge we need to change our behavior. At family dinners, children eat more fruits and vegetables, vitamins and micronutrients, as well as fewer fried foods and soda, than they do at restaurants. In a very recent study, researchers found that home-cooked meals, as compared to ready-to-eat or fast-food meals, are lower in calories, even when the cook pays no attention to making a slimming meal. And, it’s not just that family dinners result in lower obesity rates for your kids right now, but family dinners continue to pay dividends in the future. It turns out that if kids grow up eating regular family dinners, they become young adults who have internalized healthy eating habits and continue to eat more fruits and vegetables once they’re on their own. Not surprisingly, these same young adults are less likely to be obese. These health benefits don’t come just from the food. The atmosphere at the table is a key ingredient. Researchers have found that warmth and positive communications are necessary to decrease the risk of obesity in children. Watching TV: In one study, American kindergarteners who ate dinner in front of the TV were more likely to be overweight by the time they were in third grade. Being a control freak: A parenting style that is controlling and restrictive toward food was associated with higher rates of obesity in children. Keep hostile negative comments to a minimum – or, better still, off the table altogether. Saying: “Eat your broccoli and then you can have ice cream.” In a study of preschoolers, researchers found that when parents used rewards to encourage the eating of a particular food, this strategy backfired. What happens is that kids come to dislike the foods they have been rewarded to eat. To make matters worse, their preference for the reward food increases. Talking about weight: Children of parents who discuss weight will be more likely to use unhealthy weight-control strategies such as binging and purging. It’s better to focus on healthy eating than to worry about your child’s weight. Even more important than the talk is the parents’ behavior: Those who are on diets are more likely to have kids with eating disorders. Restricting certain foods like cookies and chips. Researches at Penn State University showed that children crave more of the foods that are forbidden. Children who were given unlimited access to treats ate fewer than those who were told that they had to wait ten minutes. Consumption of the restricted cookies actually tripled as compared to consumption of the freely available cookies. This is an ancient story. As far back as the Garden of Eden, forbidden foods have been irresistible. It’s not just the President who can put down his burdens when he eats family dinner. Researchers have found that when most families have dinner together, they experience a boost in positive mood and a decrease in stress levels. Teenagers report that dinner is the main time of the day when they talk to their parents. And these same teens who eat regularly (and talk regularly) with their parents feel more connected to them and have a more positive view of the future. In addition to these positive associations to family dinner, there is a pile of studies that show that regular dinner is linked to lowering many high-risk behaviors, like smoking, marijuana use, binge-drinking, school problems, eating disorders and early sexual activity. In one large study of adolescents, regular family dinners were associated with lower rates of depression. Recently, a study found that kids who had been victims of cyberbullying suffered fewer damaging consequences from the bullying if they ate regular dinners. None of these benefits require that you spend hours in the kitchen or serve organic parsnips. The most essential ingredients for a great family dinner are warmth and connection. If family members sit in cold silence or kids don’t feel comfortable talking, family dinner won’t confer any positive benefits. Sharing a healthy salad won’t transform a tense parent-child relationship, but it is the most reliable time of the day for parents to check their children’s emotional temperatures. The First Lady knows this first-hand from her own family dinners. The science supporting her is the icing on the cake. A version of this article originally appeared on Psychology Today. Anne Fishel is an Associate Clinical Professor of Psychology at the Harvard Medical School and the Director of the Family and Couples Therapy Program at Massachusetts General Hospital. She has lectured and written about the benefits of family meals. Her new book, Home for Dinner: Mixing Food, Fun and Conversation for Happier Families and Healthier Kids is now available from Amacom Books.